For further information regarding SKYWAN 5C, access this link to download the PDF datasheet. [SatNews] Astrium has announced the upcoming launch of Astrium Services’ next generation SKYWAN 5G SATCOM modem at the AfricaCom Exhibition. The SKYWAN modem family is a reliable, flexible and versatile satellite communication platform for customer centric networks. It is a bi-directional MF-TDMA plus DVB system that supports voice, video and data applications in the most bandwidth efficient manner. The SKYWAN modem family is part of ND SatCom’s product range. The next generation SKYWAN 5G brings new benefits to its network operators. Total cost of ownership is significantly reduced thanks to the fact that only one type of device is needed for all roles in the network. This saves costs in terms of logistics, certifications, network configuration and maintenance. SKYWAN 5G enables star, mesh, multi-star or hybrid topologies with Communications-On-The-move (COTM) support. 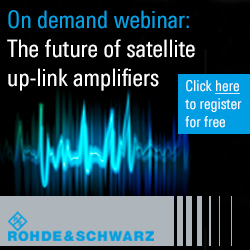 No matter what type of network is requested, the unique hardware design of SKYWAN 5G reliably fits all existing topologies within the VSAT world. Each unit can act either as a hub or master station, therefore adding agility in terms of its network role. Geographical redundancy of the master station is already built-in. The device is so flexible that the customer can change the topology at a later point, use the unit for other networks or even split or pool networks together. Peak IP rates on LAN ports up to 20Mbps in transmit and receive direction is supported to cover current demands for network speed. Measuring in at only 1 RU, the SKYWAN 5G is the smallest hub device on the market that can also support its outdoor equipment using its own power supply. It offers the option of being either mounted in a rack or to be used as a table top device. Its light weight and slim dimensions contributes to cost savings on shipping and storage. A SKYWAN 5G network requires no standard hub but enables high speed communication between remote network sites. With SKYWAN’s industry leading fully meshed network topology support, connectivity can be established between any two stations in the network with a single satellite hop. This capability allows deployment of remote to remote applications (such as video conferencing/collaboration, voice communications) between sites with minimal satellite bandwidth utilization and link delay. Up to 20Mbps bi-directional communication is supported by the TDMA system. ND SatCom innovative technologies are deployed in government and defence, broadcast and media, enterprise and telecom environments worldwide. The ND SatCom technologies have more than 30 years of experience in the satellite networks and systems businesses, and provide a reliable source of comprehensive and secure turnkey and tailored system engineered solutions. 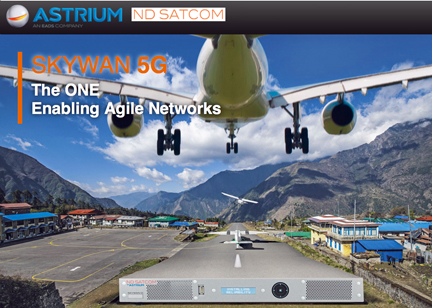 “SKYWAN 5G unlocks new business opportunities with improved total cost of ownership for service providers that need to leverage multiple hub or hubless network configurations – something that is not easily achieved by other vendor platforms” said Petra Visuri, Head of Product Management and Marketing at ND SatCom, Astrium Services. “The SKYWAN 5G modem is currently undergoing diligent customer tests and will be commercially available in Q2, 2014”. Astrium Services—ND SatCom is located at booth E2c at the AfricaCom Exhibition, which runs from November 12th through the 14th.